Go behind the scenes with 'The Natural' as if you were part of his training camp entourage! Learn strategies, techniques & drills used by Randy to conquer the UFC Octagon! Privately screen award winning documentary, 'FIGHTER', featuring The Naturals rise to fame! See Randy's first non-UFC fight vs World Shooto Champion, Enson Innoue! Watch Randy's Pro Submission debut vs Strikeforce Champion Ronaldo 'Jacare'! Own a piece of History while experiencing invaluable insight from the Master himself! 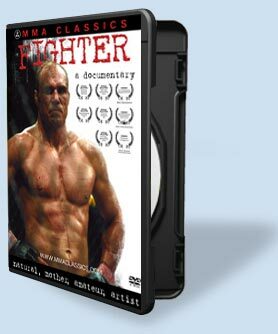 Winner of "BEST DOCUMENTARY" at the FAIF Film Festival in Hollywood, CA and "BEST BIOGRAPHY" at the NYIIFV Festival in New York, NY, 'FIGHTER', looks back to capture a slice of sports history, as Randy "The Natural" Couture chases his first Ultimate Fighting World Championship™ Belt. The documentary "takes you deep into the world of Couture… a man who is now considered the personification of everything good about this sport". Shot and Directed by Award Winning Director Pericles Lewnes. "This was a very well put together piece about what really goes on in the life of a (Mixed Martial Arts) Fighter... A definite MUST own for any true MMA fan, but that is only one guys opinion"
"Enjoyed the combination of instructional alternating with behind-the-scenes segments, UFC highlights, training sessions and outtakes. It keeps it interesting... watched the boxing, thought, "Oh no, way too basic." but then Randy starts to add in the strikes off the clinch...."
"This DVD should have two titles; 'How to Takedown a Kickboxer' and 'Controlled Ground & Pound'... done by the master himself. Thanks for this hidden gem!" Witness martial arts history unfold at the Professional Submission League's, "X-Mission" featuring the historic grappling match between UFC Hall of Famer, Randy 'the Natural' Couture vs BJJ & ADCC Mundial Champion, Ronaldo 'Jacare' Souza. "X-Mission" is hosted by Eddie Bravo, founder of 10th Planet BJJ, along with the voice of the Seattle Mariners, sports radio personality Ian Furness. "X-Mission" also includes Jake Shields vs Marcelo Garcia, the debut of Kron Gracie, TUF competitors Mac Danzig and Vinicius Magalhaes among others. "By far the best prouced submission wrestling video on the market... the rules are a bit unusual but the line up of MMA & BJJ legends is Outrageous! Cheers to Eddie Bravo for his excellent, insightful commentary." DVD Title: Who's Still Standing? See them ALL on one DVD before they were LEGENDS! "Wow this is one of the best MMA fight compilation DVDs ever! Frank Trigg vs. Jean Jacques Machado is one of the all-time classics... I can't say enough about this DVD with Randy Couture, Frank Shamrock, Enson Inoue, Dan Henderson, Carlos Newton... enough said!"."